Atlantis, an oasis of perfectly white sand. Dunes rising into the sky as far as the eye can see. 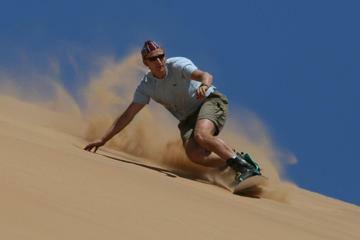 Explore this breathtaking landscape by quad bike, then sandboard down the biggest dunes you dare. On the West Coast, just outside of Cape Town, this serene natural playground is easily accessible. A favourite among locals with toys, who usually exploring on motocross bikes or 4×4 vehicles. The day starts at your Cape Town hotel. You are pickup up by your driver/professional guide in an air-conditioned van for a scenic trip just 43km (26 miles) down the West Coast to Atlantis dunes. You arrive at the parking lot. The sand is white, but nothing too impressive yet. Here you are introduced to your quad bike and readied for the adventure. Helmets on, you head off down a soft sandy track. Then, no more than a few hundred meters later the dunes open up, revealing their scale and magnitude. As far as the eye can see, giant white mountains shifting slowly as the years go by. On quad bikes, you are extremely mobile and can find some truly awe-inspiring view spots. On the other hand, if you want to get the heart pumping, you can spend your time on the bikes. One can have some serious fun on a quad bike in the dunes! Now that you have scoped the lay of the land, it is time to break out the sandboards. Choose the steepest hill you dare and set off. Carving your way down the hill, soft landing either side, its a whole lot of fun. Atlantis is such a cool place. I still can’t believe how white the sand is, never seen anything like it before. I really enjoyed riding the bikes around the dunes, really shows you the immense scale of the place. You feel really small at the top of some of the bigger dunes.